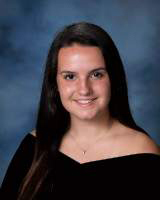 Warwick High School is proud to select senior Kayleigh Ketterer as this week’s Bill Garcia Allstate Student-Athlete of the Week. Kayleigh is a guard for the varsity basketball team in the winter and competes as an infielder for the varsity softball team in the spring. The basketball team defeated both Monroe Woodbury and Washingtonville last week and is currently 13-3, seeking a top seed in the Section IX basketball tournament. Kayleigh has an academic average of 94 overall and has been recognized as a scholar-athlete for both the winter and spring seasons. Her class load includes OCCC calculus, OCCC trigonometry and AP biology. She has decided to study nursing but has not yet chosen a school. Kayleigh is the daughter of Liz and Jim Ketterer of Monroe. She has two brothers, Andy and Jim, and her sister Jacki is a junior at East Stroudsburg.